two intense months are coming to an end as the new work in the Fantaisie Chorégraphique Series: CHOREOGRAPHIC FANTASY No. 3 premiered on 29th of May and went on throughout the June, programed by the Zagreb Dance Center. It has been a truly encompassing process carried out by five amazing dancers; Filipa Bavčević, Marin Lemić, Silvia Marchig, Sara Piljek & Nastasja Štefanić, that gave it its depth and sense. Created under the working title Open Processes, this piece subscribes itself to dance as a process, re-establishing some of the tenets of historical modernism. 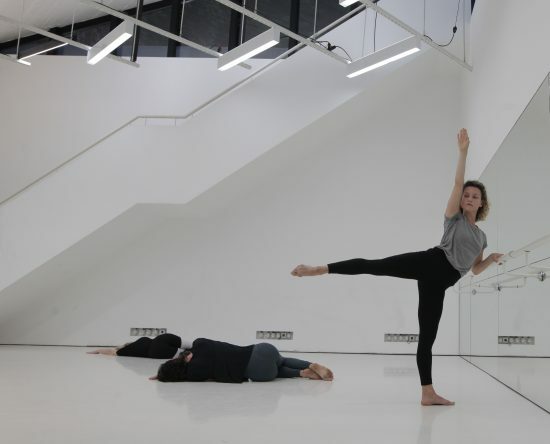 Performed in a dance studio set up, choreography is meeting Sonatas and Interludes for Prepared Piano by John Cage, confronting diverse elements of inner and outer architecture. While still fresh from the process I gathered some thoughts on it as Seeing Things As They Are, and a complete documentation of the work is now online and can be viewed here. A week before the premiere as we were discussing final details about the atmosphere of performing this work, the idea of seeing things sharply – exactly as they are, came around. We talked about its meaning and versions of it, and it became a manifesto of performing this work; being laid out and close, visible and tender, clear and deliberate, and at the same time granting all those things to the recipient, to the viewer. Dancing in that space of amplified sharpness meant that some void spots may arise, blurry fields being palpable as they enter, and holding them softly ensured that the next clear impulse will appear, a clear line that will open a moment that will arrive next. While bodies are voluminous and archaic, vibrating all kinds of emotional clusters as they proceed through the event of time, thus continuously reflecting each other by meaning, impression and narration, seeing things as they are means navigating through and with that, carrying oneself and others, as well as embedding others into oneself; viewing and being viewed, observing and being observed, interpreting and being interpreted. And then again, clearness will arise, opening of things as they are, however they are – where welcoming them means meeting them with unshattered eyes, meticulous and barefaced. With ‘Sonatas and Interludes’ Cage reaches the apex of his prepared piano pieces. The outline of the preparations is enormous and the preparation will reach nearly the entire range of the instrument. ‘The Table of Preparations for Sonatas and Interludes’ is highly complex; the process to prepare the piano takes approximately three hours. In these tables, Cage shows the tones that the interpreter should prepare, the material that should be used, this strings that the material should be placed on in addition to the distance that the pianist should put the object. As the reader can see, after the Material is inserted the first time, Cage once again repeats the material, the distance etc. This is because Cage desires the same note to be prepared two or three times in the same string but with a different distance and occasionally with a different material. The sound produced when there are two or more objects in the same string is entirely different than when there is just a single object in the string. In this piece he uses the most common objects to prepare a piano which are a bolt and screw, along with other materials like nut, plastic, rubber and eraser. In the table of preparation, one can see that he requires a total of twenty-five varied bolts. He did not write about the size of the bolts, although he noted about different types of bolts, such as: bolt (just bolt), small bolt, medium bolt, furniture bolt, long bolt. It is impressive to discover the difference of sounds between the same object but with different sizes, as I observed that a heavier object produces a strong, short rattle. In general, the sound of the bolt in the string produces little alteration in the sound of the pitches, but it does generate a percussive character. An important difference from the sound of the screws is that the sound of the bolt produces high harmonics. From the choreographic viewpoint this complexity in preparation required for the deliverance of Sonatas and Interludes is perfectly understandable, as the experimentation with the material requires a precise framework upon which diverse outputs can press themselves against. What is here important to notice is that the inherent configuration of the objects itself is already their content, in that extended sense. Meaning, its original function is partially embedded but then also completely irrelevant at the same time, because their configuration on the scale of weight, shape, material, density, volume or size will then deliver different sound, or are able (in this setting) to deliver that kind of sound in the first place. So it is primarily about the interplay of inner and outer configurations and their relation to the objects and phenomena around them or where ever they may be placed upon, are pressing themselves upon, or what ever is being contrasted to them or around them. Choreographically that would stretch even further, approaching seemingly not-objectual phenomena such as touch, orientation, sense or sentience as the final object, as they all (to mention only some) are capable of being understood as autonomous clusters of configuration that then by colliding with other parameters can and will deliver extraordinary line of another kind of outcome. Arabesque-inner voidness-dense corner or breath-strong temperature-penché or inner emptying-sudden light-another body encounter will then press themselves against or even with the other elements that are present at that moment and listening to them as well as translating them further is creating the fabric of that very dance. Each of these elements and propositions inhabits singular rehearsal as well as is the part of the work itself; understanding its singular configuration and impact within the singular dance and the outer output of it. To visualize it even further, it would be more precise to understand them as singular large surfaces, almost like geological plates that are shifting across and over each other, moving along other matter and materials and transforming them anew, incorporating them. That silent tectonic sequentially unfolds the final territory of the work, that is in that sense ever unfolding, as each day points out to another dynamic that takes over. Seeing things as they are means knowing them sharply and allowing them to transform along while navigating them with and around that particular dance, revealing their inherent configurations to create ripples in collision with themselves and with whatever might be understood as the other. In optical closeness of this dance, that immediateness translates all other elements as just another parameters to be explored with, to be placed upon the string. That slot of clear requires a certain shift in observing but also in performing; in understanding oneself as the body of dance, a dancer, a catalyst, a phantasmagoric surface, where diverse conjunctions are taking place in an event of a choreography reloading itself and from its inherent core while simultaneously being that very core. Finally, seeing things as they are consists of seeing, of things and of as they are; comprehending that state as a permanent non-place.